We've provided several posts already over the past couple months of Best Western's fall promotion that offers double points on all stays but what's even better with the offer is the redemption side of it! You can redeem 10,000 points for a reward night at any Best Western Hotel in North America. Of course you wouldn't want to redeem that amount for a hotel that's only 8,000 points but with many being in the 16,000 to 24,000 point range per night you can see why this becomes a great offer. As you can see the Redemption Story here is one that provides some big time value! 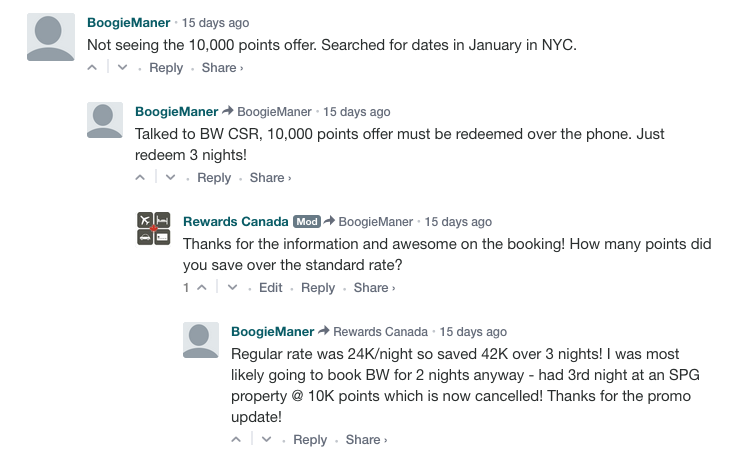 BoogieManer booekd a hotel in New York City for only 10,000 points per night (30,000 total) instead of 24,000 points per night (72,000 total) That is some huge savings and an example how you really need to keep on top of the game and utilize promotions like this when they come about. Good job BoogieManer! The hotel normally goes for 36,000 points per night but during this promotion it is only 10,000 points! Have you or are you going to take advantage of this offer? Tell us your story in the comments section below!